As a child, Micheal Two Bulls was surrounded by creativity. As part of a large extended family of Native artists, Michael watched his aunts and uncles create everything from intricate beadwork and work carvings to contemporary paintings. Inspired by their work, he began drawing at an early age, and ultimately found his way to the Institute of American Indian Arts in Santa Fe, New Mexico. There, he discovered his own unique style—and found his voice as an artist. During his time at the Institute, Micheal discovered a passion for printmaking that has guided his career in the years since. As a student, he had the chance to study and work alongside with professors who were also master printers, and his appreciation for the medium grew quickly. His professors become mentors—and today, printmaking plays a fundamental role in his mixed-media work, which also incorporates painting, collage, and sculpture. It was his expressions in printmaking that earned Micheal the prestigious Brother C.M. Simon Award at last year’s Red Cloud Indian Art Show. His winning piece—Battlefield A, B, C—was a collaborative creative developed with his long-time friend and writing professor, poet Mark Turcotte. Turcotte’s poem Battlefield, a reflection on growing up on a reservation, became the inspiration for Micheal’s visual interpretations. 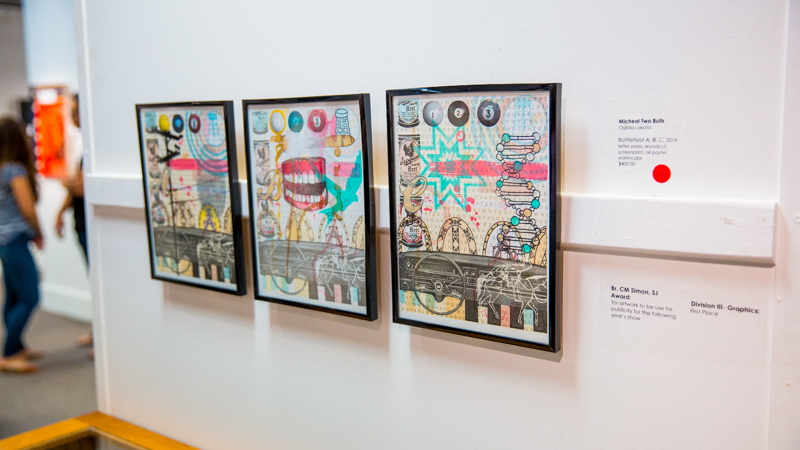 The final piece is set of three bold, contemporary side-by-side prints revealing a series of overlapping images from a childhood in Indian Country. To create the piece, Micheal worked with another former professor, Mitchell Marti, master printer at Interbang Press in Santa Fe. And in the years to come, Micheal is committed to doing more to support local Native artists. 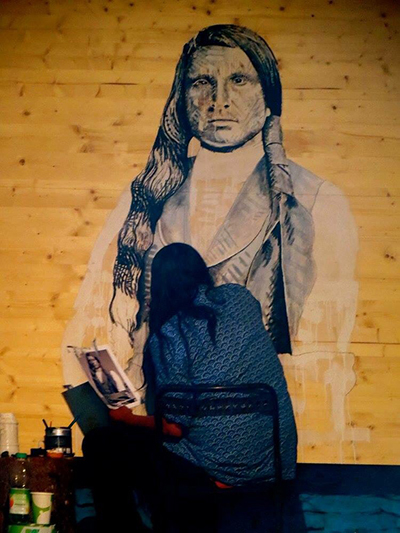 He and a number of other family members have been working together to create a gallery and coffee shop in Red Shirt Table, a small village at the edge of the Badlands on the Pine Ridge Reservation. He says the space will ultimately serve as a place for community members to gather—and for artists to share their work, earn a sustainable income, and build their careers. 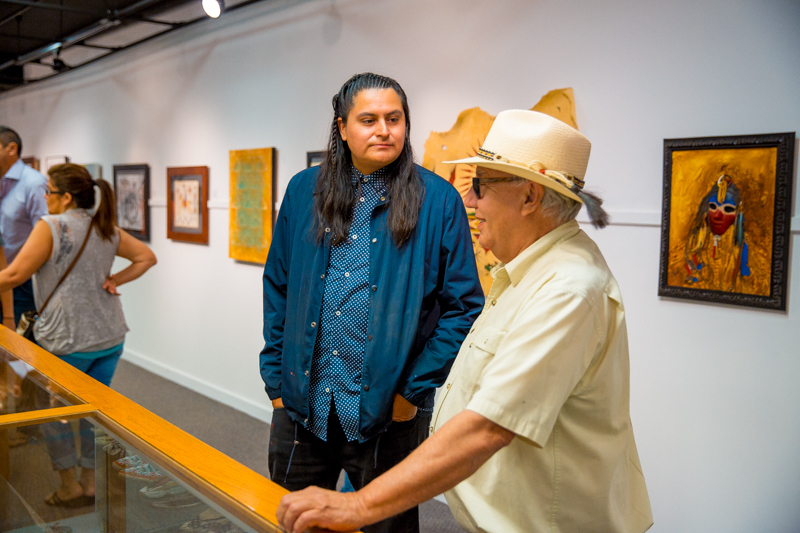 Once the gallery is up and running, Micheal and his wife, Angel Two Bulls, plan to expand on the space in order to create a cultural center and, eventually, a school for emerging Native artists. They want to build upon the few arts education programs already working on the reservation—and give young people another place to find their own voices as artists. Photos © 2017 Red Cloud Indian School, Inc.